With the number of start-ups and innovations mushrooming in the country, you would think India is a nation of confident young entrepreneurs. And yet, there are still so many who are stuck in jobs they hate or lives they dislike because they’re too scared to follow their dreams or pursue their passions. 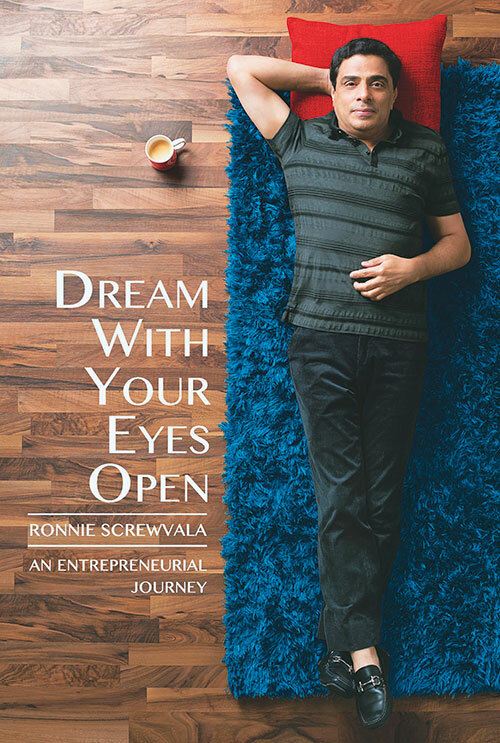 For all those who are afraid of taking the plunge, Ronnie Screwvala’s book offers insights and experiences from a fascinating entrepreneurial journey. A biography of the UTV founder and CEO, the tome is sure to inspire people to chase their desires — with their eyes open. What inspired you to write Dream With Your Eyes Open? The more entrepreneurs and professionals I meet, the more it’s clear to me that India has a long way to go before it becomes a country of first-generation entrepreneurs. Most people are challenged by a lack of family support and are engulfed by their own deep-rooted fear of failure. But there is a growing spirit of entrepreneurship, coupled with a new wave of optimism, aspiration and ambition in India. It was enough inspiration for me to pen what I wanted to share with entrepreneurs at various stages of their journeys. Do you think reading other people’s success stories helps? At any stage of your learning cycle, you learn from others’ experiences as much as you learn from your own. I think if stories are told with a simple narrative and real-life examples, they would be of help to many. In the next decade, we will see more books about entrepreneurial failures than successes, as there is more to learn from the former. Almost a third of my book focuses on my failures and setbacks. How easy or difficult is it to put down your life — journeys, mistakes, triumphs — for the world to see? I am not a trained or disciplined writer. So I did have a colleague work with me, and he gave me the structure and set the tone and language that then allowed me to let the flow happen. Overall, the experience was cathartic — when you dredge up the last 25 years of your life, it gives you a new perspective. It also summarises the learning that you would otherwise not have been able to encapsulate into chapters for the future. Why do you think so many people are still scared to follow their dreams? In India we do not evangelise failure enough for all to know that one will fail not once but many times — what matters is how you get up and move forward. I think we definitely need to overcome this. We only lack confidence. And yes, there will be many challenges and setbacks but if you stay the course, you will prevail. What message do you hope readers will take away from your book? Don’t wait a day more to set out on whatever journey it is that you want to embark on. Be clear and convinced, and then stay with it. No one will sound the bugle for the charge up the hill. Bring your own bugle and running shoes, set your sights on the peak and settle for nothing else. Bring your ideas, your vision and your passion, and prove to the world that you can make a difference.